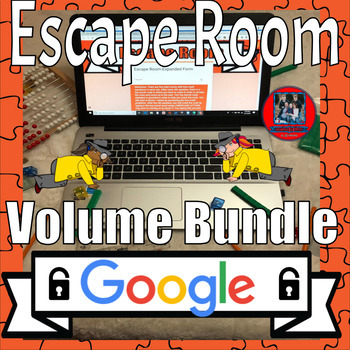 Use these CCSS aligned paperless interactive Escape Rooms and self-grading assessments on Google Forms as a highly engaging assessments, exit slips, test prep, or just interactive additional practice. There are over 190 auto-graded math problems in which the students will display their understanding of Volume in this bundle. What a great way to check for understanding while students have a blast!!! These Escape Rooms on Google Forms will be the easiest you have ever implemented as they can be completed by students using Chromebooks, computers, laptops,I-Pads, etc. via Google Forms. 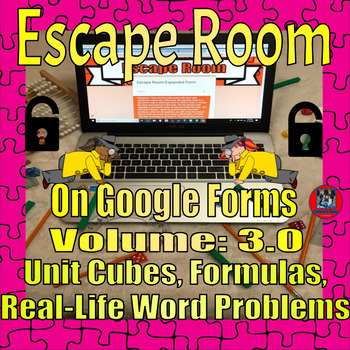 Digital Escape Room 3.0: Unit Cubes, Formulas, and Real-Life Word Problems in particular, new features have been added to this escape room to make it even better for students--i.e. funny memes to boost engagement and a new section on the Google Form for each of the six rooms. Students will absolutely love this new format to my digital escape room. Room 1--Calculating volume of a simple rectangular prisms by multiplying whole numbers. Also includes the secret code word. Room 2--Calculating volume of a simple rectangular prisms by multiplying larger whole numbers. Also includes the secret code word. Room 3--Calculating volume of a rectangular prisms by multiplying whole numbers and decimals. Also includes the secret code word. Room 4--Calculating volume of a compound rectangular prisms by multiplying whole numbers--i.e. two adjoining rectangular prisms. Also includes the secret code word. Room 5--Calculating volume of a compound rectangular prism by multiplying larger whole numbers and decimals--i.e. three adjoining rectangular prisms. Also includes the secret code word. After typing in the secret code to this room, they have to type in all the words to determine the secret math message to finally ESCAPE! 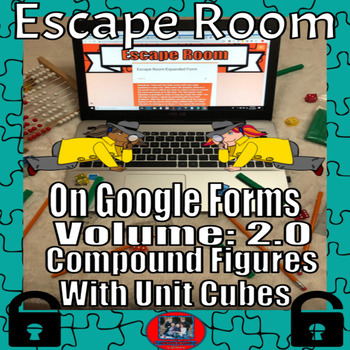 In Digital Escape Room-Volume 2.0: Compound Figures with Unit Cubes there are six rooms to escape in which students must perform four tasks and decode a secret message prior to moving on to the next room. Within the rooms there are 24 math problems where students have to determine the volume of compound figures using unit cubes with each room increasing in difficulty. Prior to moving to the next room they decode a secret word using a code to escape to the next one. Room 1--Calculating volume of a simple rectangular prisms by counting unit cubes. Room 2--Calculating volume of a rectangular compound prisms by counting unit cubes in each rectangular prism (two/three adjoining rectangular prisms) and adding the two or three volumes to get the total volume. Also includes the secret code word. Room 3--Using the formula to calculate volume of rectangular prisms by multiplying whole numbers, fractions, and decimals. Also includes the secret code word. Room 4--Calculating volume of a compound rectangular prisms using the formula--in each rectangular prism (two/three adjoining rectangular prisms) and adding the two or three volumes to get the total volume. Also includes the secret code word. Room 5--Using real-life word problems to calculate volume and/or determine the missing heights of items. Students have to use their problem solving skills to apply their understanding of volume to solve real-world problems. Room 6--Using real-life word problems to calculate volume and/or determine the missing heights of items. Students have to use their problem solving skills to apply their understanding of volume to solve real-world problems. After typing in the secret code to this room, they have to type in all the words to determine the secret math message to finally ESCAPE! Specific directions with screen shots on how to save the Google Form to your drive, how to assign the form to students, and how to see student responses are included. 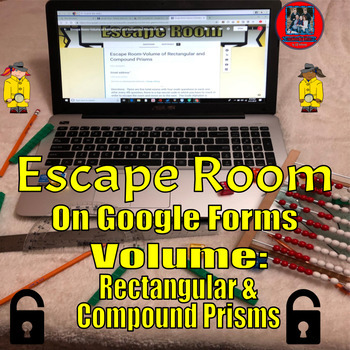 Also included are specific directions which the students will use to complete the Digital Escape Room-Volume 3.0: Unit Cubes, Formulas, & Real-Life Word Problems. Volume: Rectangular Prisms-Auto-Grading 5 Pack on Google Forms-Assessments and Interactive Worksheets for Extra Practice--There are 5 Auto-Graded Google Forms included in this bundle which students use model representations to determine the volume for rectangular prisms. (100 total multiple choice problems in this 5-Pack.) The students have to calculate volume of various rectangles using whole numbers as well as decimals. Each form increases in difficulty with Form A being the least challenging while Form E is the most challenging. These Google Forms give students/teachers instantaneous feedback/percentage correct. Teachers can use these Google Forms for formative assessments, quizzes, or for homework grades. Interactive Digital Task Cards-Volume with Unit Cubes on Google Slides Use these CCSS aligned interactive digital task cards as a highly engaging assessment, exit ticket, or interactive additional practice. 1) Specific directions on how students use the interactive digital task cards. 2) Specific directions with screen shots on how to save a copy of this to your Google Drive, which will also give you editing rights. 3) Specific directions with screen shots on how to assign them via Google Classroom. 4) A printable answer key. 5) A link to get a copy of the product. With these Interactive Digital Task Cards-Volume students can utilize unit cubes and/or formulas to calculate volume of rectangular prisms and simple compound prisms. The directions are simple as correct responses force them to click to the next problem while incorrect responses force them to go back and re-work the problem.